Fill in the missing numbers 1-10 in these number writing worksheets. Kids can use the clues on each page by counting the dots, reading (with some help, if needed) the number words, or both. One page is a primer – it has a few numbers written in already to help beginners with sequencing. Nice wide primary writing lines have been provided to help guide kids to write their numbers neatly and evenly. Ready, set, go! Start filling in those numbers! Children use their knowledge of the number sequence to fill in the missing numbers on the primary writing lines. Write the numbers 1 – 10 in sequence neatly on the primary writing lines. A worksheet with missing numbers 1-10. Use the dots as clues. Count them and write the number on the lines. Have fun! 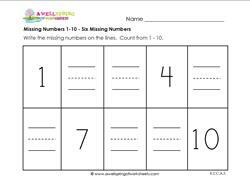 Another missing numbers 1-10 worksheet! 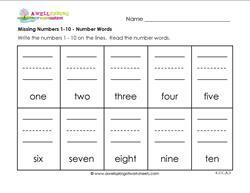 This time kids can read the number words and write the corresponding numbers on the lines. 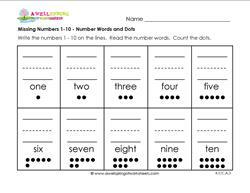 Read the number words and count the dots in this missing numbers 1-10 worksheet. Then write the corresponding numbers on the lines.